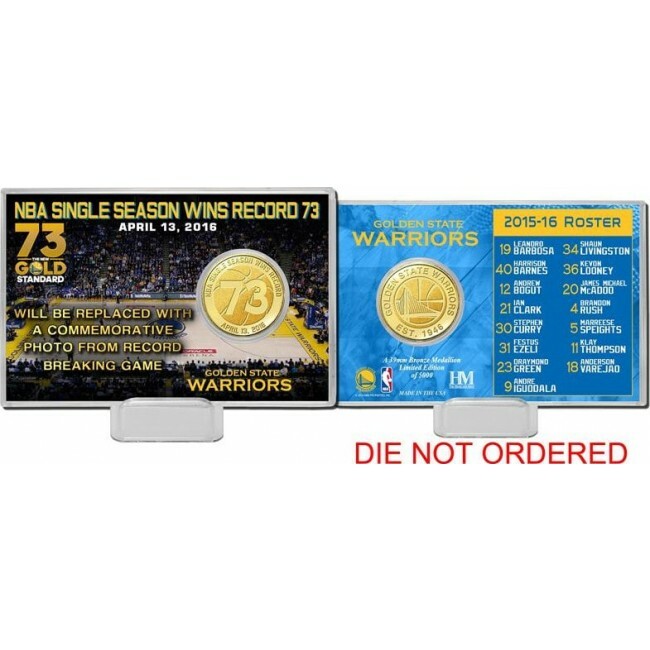 39mm bronze coin is minted to commemorate the 2016 NBA all-time wins record set by the Golden State Warriors and displayed in a 4''x6'' acrylic holder! Unique, officially licensed collectible is a limited edition of only 5,000! Limited Edition! A 39mm bronze coin is minted to commemorate the 2016 NBA all-time wins record set by the Golden State Warriors and displayed in a 4''x6'' acrylic holder! The bronze coin card also includes a commemorative 73 win card with images of Steph Curry & the golden boys during the record setting game and the team roster listed on the back. Each silver coin card is delivered with a display stand. This unique collectible is a limited run of only 5,000 and it is officially licensed by the NBA. Proudly made in the U.S.A. by The Highland Mint!